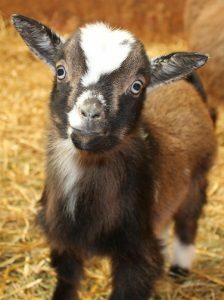 NDs are now the fastest growing breed of dairy goats in the U.S. That means you have tons of choices when it comes to buying goats. What makes us different from every other breeder out there? Established herd — We have been raising NDs since 2002. We bought our last does in 2005 and have been keeping the best of the best to continue breeding for more than a decade. All of our does were born on this farm, which means that we know the personality, mammary system, and production history of their mothers, grandmothers, and sometimes as far back as their great great great grandmothers. Milking herd — As NDs have become more popular, some people have unfortunately started breeding them as pets, which means that a lot of bad dairy genetics are being perpetuated because people just want blue eyes or lots of spots. We milk all of our goats for complete lactations, meaning that we don’t stop until they dry up or until they are three months pregnant. There is only one way to know if you have good milk goats — milk them. Biosecurity — We have a closed herd, don’t show or exhibit our goats, don’t buy does, and almost never buy a buck. For complete details on our herd health, click here. 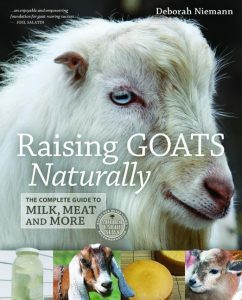 Knowledge — In addition to having raised goats since 2002, I’m also the author of three books on homesteading and sustainable living, including Raising Goats Naturally: A Complete Guide to Milk, Meat, and More. Experienced in shipping goats — Our goats have gone to live in states from coast to coast, so if you don’t want to drive to our farm to pick up your new goats, we are experienced in shipping them by air. Ongoing mentorship — I am always available to everyone who purchases goats from us, to provide information and advice whenever questions pop up about your goats. I want you to call or email me when you have questions about the goats you bought from me.